3. Ring die (mold) with double loop design to extend the service life of the mold. 4. 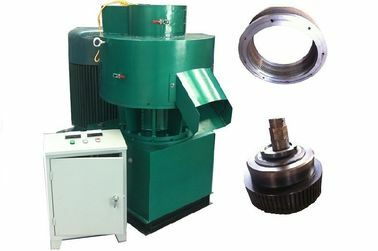 Roller and mold are made by Alloy steel, after heat treatment, hardness is more than 52. 5. FD450 is driven by 55KW electrical motor. Alloy steel, after heat treatment, hardness is more than 52. 1. Double loop ring mold design to extend the service life of the mold. 3. With high density, high fuel value, low moisture and low ash content output wood fuel pellets.